REDSTONE ARSENAL, Ala. -- Standing at the front of a packed conference room with Army Materiel Command commander Gen. Gus Perna, five employees of the Aviation and Missile Command were congratulated for the work they have done to push forward the command's sustainment, maintenance and logistics mission. 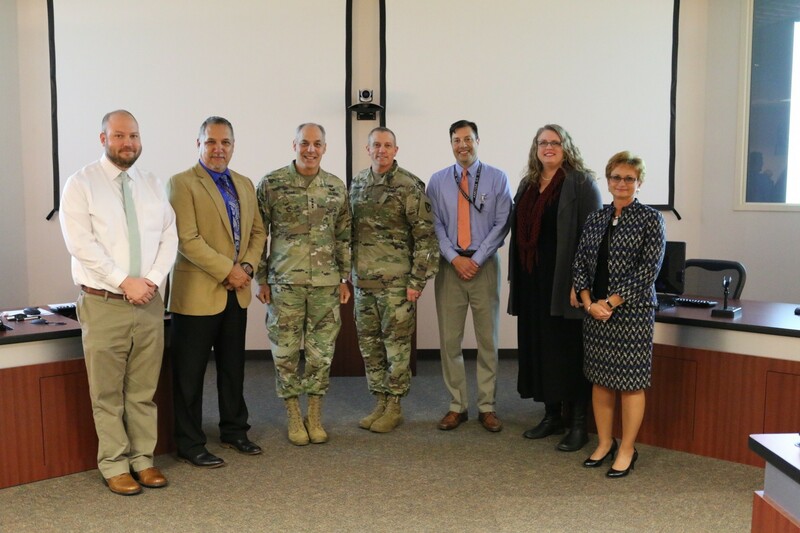 Marsha Bailey, Jessica Dunaway, Rudy Flores, Matt Merritt and Scottie Smith were recognized at AMCOM's quarterly update report Oct. 26 to Perna at Redstone Arsenal. It set the stage for a meeting during which the Army's senior logistician praised AMCOM for its progress in achieving its goals. "I appreciate what you have done. You are right on the mark," Perna told AMCOM's senior leaders and directors. "But, do not get locked in. Continue to figure out ways to demonstrate how to improve and get better. The reason we are in this business is because our world is unpredictable. No one ever predicted a war that we've been in. That's why we need to be ready." AMCOM commander Maj. Gen. Doug Gabram reported that the organization continues to align to the AMC priorities of strategic readiness, future force and Soldiers and people while pursuing the standards of "Quality, Speed and Accuracy." * Communicate on a consistent basis - "I need all of you to help me run this organization," he said. * Work on a battle rhythm - Each major subordinate command should have procedures and strategies that continue to move it forward in its mission. * Recognize progress and success, but realize much more remains to be done - "We have gotten a lot done in the last three years," Perna said. "But there is still a lot more to do in the next year to bring it home. This is about being prepared to respond to any contingency. The difference between readiness and reacting is loss of American lives. We are collectively responsible for being ready. We are doing a lot of things well, but we can continue to improve." * AMC major subordinate commands should spend their budgets to ensure readiness - "This is the first time in eight years that we have had a defense budget on time," Perna said. "I need you to look at your budgets and contracts to make sure you are spending it right." Gabram updated Perna on two specific initiatives that have been a focus of AMCOM's efforts over the past two years: supply availability of parts in general and depth "on the shelves" of the most critical parts, which Gabram referred to as "strategic depth." Gabram briefed the efforts that led AMCOM to designate those critical parts as "readiness drivers," and what it means to achieve strategic depth. "We want 90 days of stock on the shelf of our readiness drivers," Gabram said. "If we have to respond to a contingency, the demand for those could increase by 50 percent or more." As part of AMCOM's effort to improve supply availability and to achieve strategic depth of the most critical parts, AMCOM chief of staff Col. Shawn Prickett has been working 22 specific supply chain issues for many months. He briefed his team's findings and emphasized the need for accurate and consistent information from suppliers. After this discussion, readiness updates from the AMCOM Logistics Center, Corpus Christi Army Depot, Letterkenny Army Depot and the Aviation Center for Logistics Command at Fort Rucker were presented to Perna, as well as an update on the AMCOM Fleet Management Expansion efforts ongoing at Fort Benning, Georgia; Fort Sill, Oklahoma; and Fort Huachuca, Arizona. 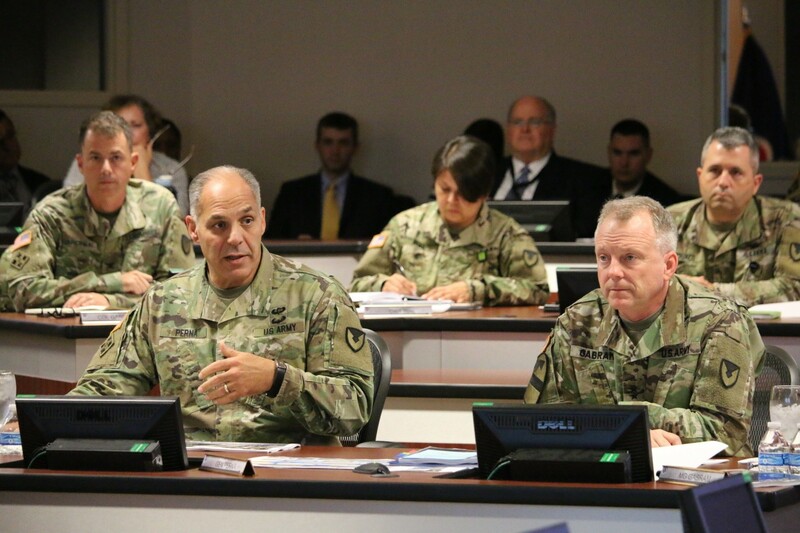 In closing the session, Perna challenged AMCOM leadership to think differently than in the past; ensure employees are trained, held accountable and focused on achieving the output that is essential to meet Army requirements. He noted that supervisors are the "centers of gravity for success or failure" in all AMCOM efforts. "We can never lose sight of the number one priority in all that we do. In our work, quality comes first and then we drive in with speed and accuracy," Perna said. "We have to rely on the civilian workforce to do the work we need. We are changing the culture and growing the culture. We have to modernize to meet current requirements. "The Army needs us to lead through this. It's about people being accountable. We need 100 percent of the people doing 100 percent of the right work. We need to push accountability and be focused on readiness." Seventeen years of war have led to changes in readiness requirements, challenges with sustainment of aging assets, issues with defense contractors and intellectual property rights, and growth in Foreign Military Sales - all which have impacted the supply chain and made it more difficult to manage supply availability, Perna said. "It's important that the boss knows we're on track, we're on target, that we're turning the ship," Gabram told the directors following Perna's visit. "It's the right way to go and it leads us to better things." •	Marsha Bailey, sustainment director, Utility Helicopters Project Office - Worked with industry, the depots and other sources of supply to reduce backorders ontehUH-60 Black Hawk by more than 12 percent in the past nine months. •	Jessica Dunaway, division chief, AMCOM G-8 (Resource Management) - Led AMCOM's preparation for the Sustaining Program Evaluation Group, better known as SS PEG, deep dives and prepared general officers and senior executive service briefers to present to the Secretary of the Army and the Army Chief of Staff. •	Rudy Flores, chief, Product Quality Management Branch - Developed a Product Quality Deficiency Report policy to establish timelines for trend analysis and disposition instructions. •	Matt Merritt - supervisory logistics management specialist, Attack Helicopter Avionics and Radar Division - Led his division through the demands associated with the AH-64E Apache transmission and the AH-64D/E Apache generators issues with no impact to the overall mission. •	Scottie Smith - senior budget analyst, AMCOM G-8 - Provided support to numerous AMCOM programs that enable the commands' ability to provide Sustainable Materiel Readiness. "Clearly, your work has enabled us to do better and I am very grateful for that," Perna told the employees.